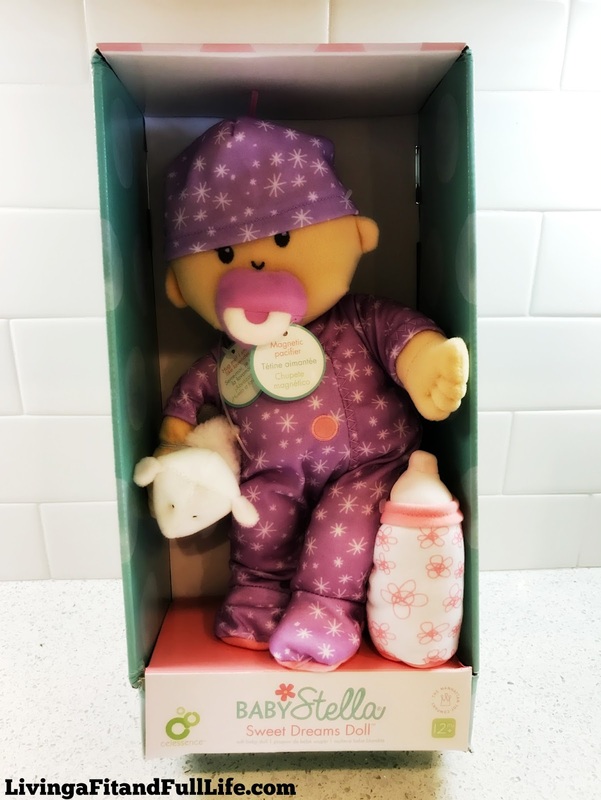 Living a Fit and Full Life: Give Them Sweet Dreams with the Baby Stella Sweet Dreams Doll from the Manhattan Toy Company! Give Them Sweet Dreams with the Baby Stella Sweet Dreams Doll from the Manhattan Toy Company! It's bedtime for Baby Stella. With her soothing lavender scent, cozy pajamas, bottle and favorite lamb to snuggle, she is sure to have sweet dreams. Scent technology by Celessence, an innovative micro-encapsulation delivery system. Gently hug doll to release her scent. The Sweet Dreams doll includes removable outfit, diaper, and magnetic pacifier and bottle. The perfect gift for baby's first birthday. Give them sweet dreams with the Baby Stella Sweet Dreams Doll from the Manhattan Toy Company! I have three girls that all absolutely love this Baby Stella Sweet Dreams Doll. They love that it comes with a binki, bottle and toy so that they can pretend to care for this sweet baby doll. What I love most about the Baby Stella Sweet Dreams Doll is that it's soft. Even the binki and bottle are soft! My five year old loves to take the Baby Stella Sweet Dreams Doll to bed with her and she always makes sure to give the baby it's bottle and then snuggle the baby until they're both fast asleep. I have to say it's helped her fall asleep at night and she seems to love it more than just about any other baby doll she's had in the past. Every time I go in to check on her at night the Baby Stella Sweet Dreams Doll from the Manhattan Toy Company is in her arms. She used to come into my room just about every night but since she's been going to bed with her Baby Stella Sweet Dreams Doll she sleeps through the night and so do I! The Baby Stella Sweet Dreams Doll from the Manhattan Toy Company is absolutely darling and makes the perfect toy for little ones!